Opening reception and book signing of Kuhn’s newest publication, Private, with the artist: Thursday, 11 September from 6-8pm. "Mona Kuhn’s newest body of work is Acido Dorado, set inside architect Robert Stone’s secluded golden palace in Joshua Tree National Park, California. 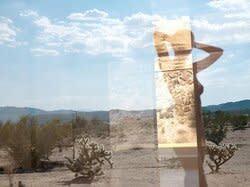 In this series, Kuhn explores her close friend and collaborator Jacintha, interacting with the American desert. Shallow pools, mirrored ceilings and glass walls frame sandy colored hallucinations filled with dreamy light leaks and seductive reflections."